I'm going to be honest with you... I don't love chalk. I always seem to end up sitting in it or getting it all over my hands or finding it dragged through my house. My co-blogging buddy EJ always comes up with the coolest chalk activities though, so I've been trying to change my attitude a bit. 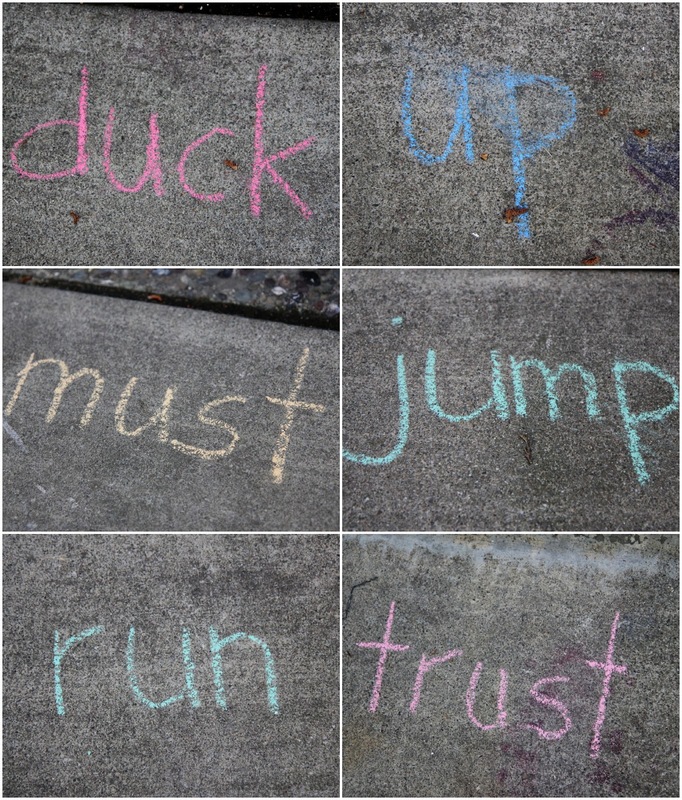 This past week my 5-year-old was learning about short u words and my daughter was exploring the alphabet, so we decided to do some chalk painting to help us have fun with letters and words! 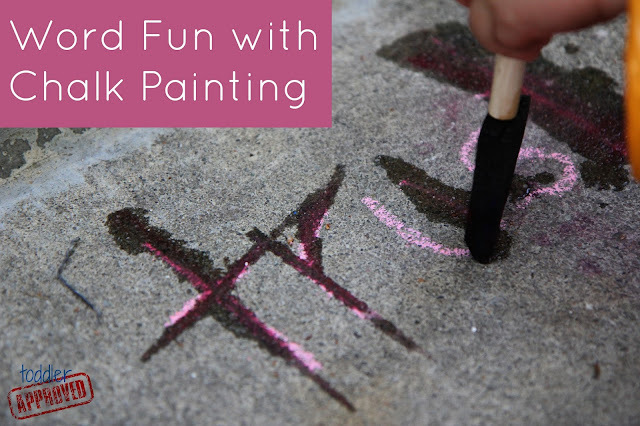 Supplies: For chalk painting all you need is a surface to write on (dark pavement is great), chalk, paintbrushes, and a cup of water. 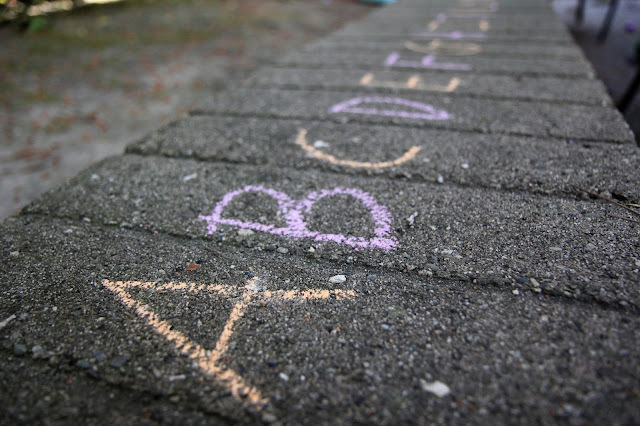 First write out the words or letters you are studying on a flat surface using chalk. Then read the word (or letter), say the word (or letter) aloud, and then trace over it with a paintbrush dipped in water. My toddler loved watching her ABCs disappear and my 5-year-old did his best to trace every letter. This activity gave us opportunities to talk about... concepts of print, letter formation, decoding strategies, and beginning/ending sounds. You can also have your child write their own letters and/or words! We also played a game where I would call out the word and my son would have to find it and paint it. Since my daughter is just learning the alphabet letters, I would just say the letter names and sounds when she would choose different letters to paint. If she painted A I would say, "Look you painted A! What sound does it make?"... or "A is at the beginning of the word apple." 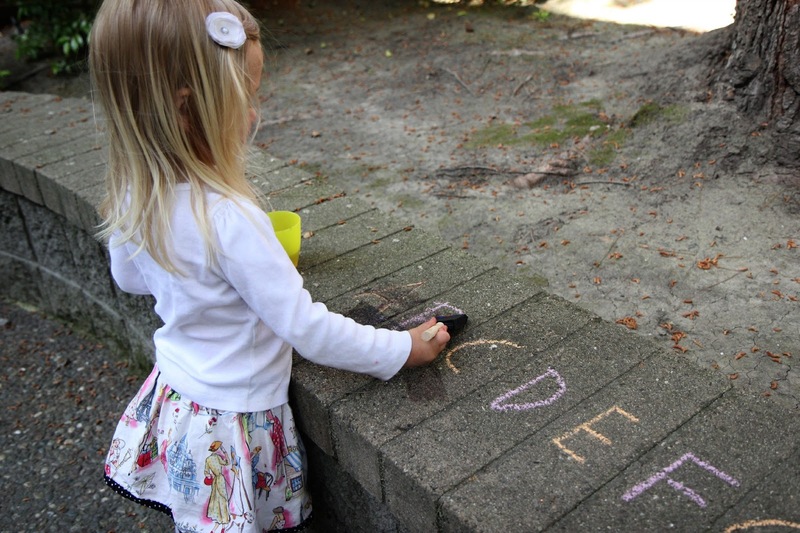 This simple chalk activity can be played again and again. We also use it to introduce new words before we read books with those words. 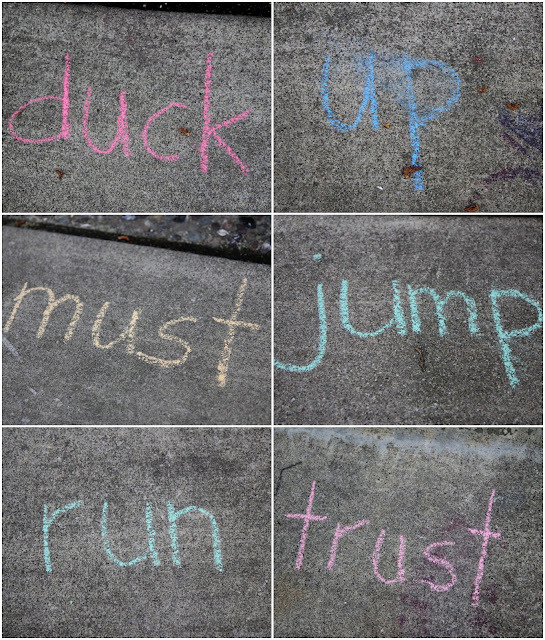 Do you have any other favorite ways you learn with chalk? My 3-year-old daughter recently used sidewalk chalk to make a multi-layered masterpiece of different colors. I offered to "sign" her name to it, but she was having none of it - doing individual letters may go over better next time! Your program looks great. And I loved the pic of the alphabet written in chalk. Sadly I don't live close enough to put my child in your program. Hopefully I can find a good toddler program in Minnesota.